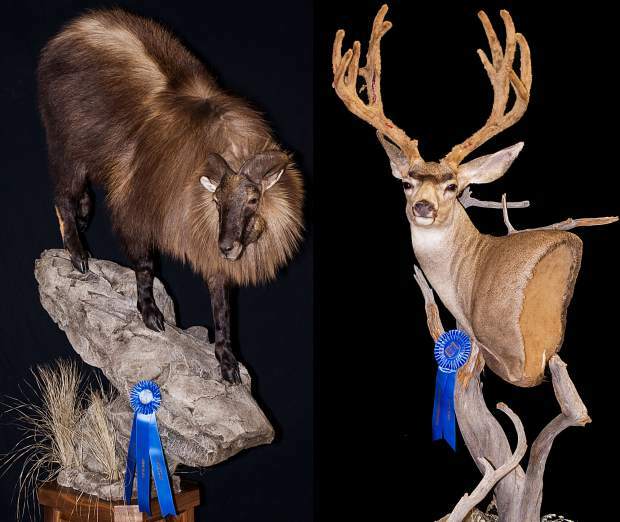 Craig taxidermist Scott Moore recevied blue ribbons at the National Taxidermist Associationâs 46th annual convention in July for his mounted tahr, left, and mule deer. One of Craig’s skilled artisans walked away with the stuff that dreams are made of last month. Scott Moore, owner of Mountain Man Taxidermy, took first-place honors during the National Taxidermist Association’s 46th annual convention in July in Layton, Utah. Moore received blue ribbons for two pieces: a tahr mount in the open class and a mule deer for the competition’s commercial class. The tahr, a goat-like animal native to mountainous Eastern Hemisphere locations, was a point of pride for Moore, who harvested the animal himself during a hunt last year in New Zealand. Preparation involved about 60 hours of work and was a little more “last-minute” than he had planned after deciding to enter the event. “I’ve been really busy the last few years and I hadn’t even made it to a state show in three or four years, so instead I went with a national one since it was so close,” he said. The mule deer was a mount he had provided for a client that he was able to borrow for use in the commercial category specifically for professional work. “It turned out really cool, and the timing all just really worked out,” he said. The blue ribbons have inspired Moore to get back into competition in the taxidermy field. He has been involved with Mountain Man since 1991 and took ownership of the business in 1998.